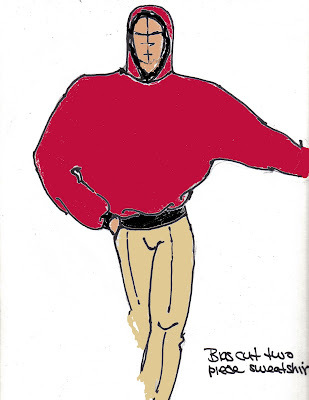 This is my pullover sweatshirt cut entirely on the bias of only two main pieces of fabric the body of shirt is cut in one with the sleeves, the underarm seam begins at the cuff and continues in a spiral to the center front and back. by eliminating seams the shirt drapes and moves on the body. I show it here with contrasting trim in the waistband, cuffs and on the hood edge. It could also be one solid color. My fabrics of choice would cashmere, silk knit, or the lightest hander kerchief linen. Spiral cutting is one of Halston's greatest innovations. As I said before his pattern cutters were brilliant in their ability to bring his ideas to reality. I've studied these concepts and use them in making men's clothing. I hope to take what seem very familiar and give it a different edge by cutting in untraditional ways.